Georgia State football is new to having a stadium to call their own after moving into Georgia State Stadium in 2017. Leasing the Georgia Dome for seven years gave the program a lackluster playing environment, but playing inside Georgia State Stadium can bridge the gap between their competitors. As a non-Power 5 program, the Panthers have traveled to handfuls of hostile environments for ‘pay-to-play games’. However, perhaps the most intense atmospheres came against rival Georgia Southern. The Panthers host Georgia Southern inside Georgia State Stadium for the first time in the regular season finale on Nov. 24. In 2015 and 2017, Georgia State traveled to Paulson Stadium to defeat the Eagles in front of rowdy crowds. “The only thing I like about Georgia Southern is playing down there because they pack the whole place out. 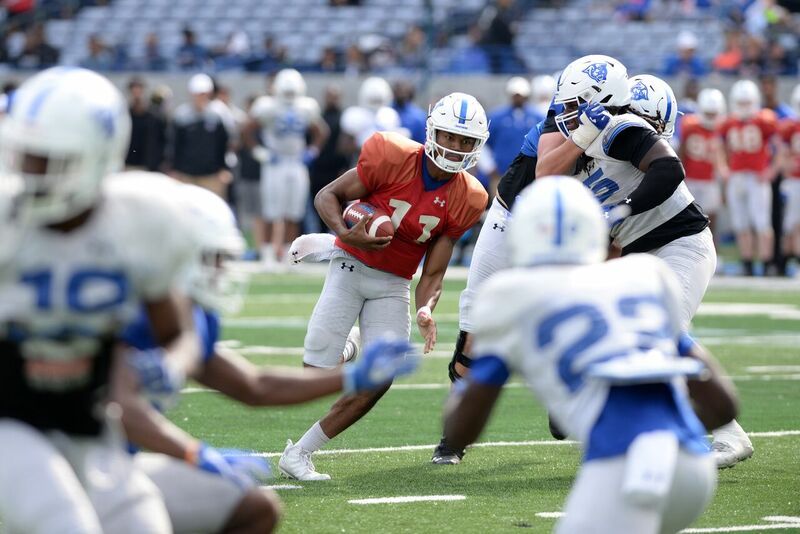 So then, we get to see everybody in the stands quiet after we win all the time,” Georgia State’s two-time All-Sun Belt Conference First Team wide receiver Penny Hart said. This season, they also play in ACC opponent NC State’s nearly 60,000-seat Carter-Finley Stadium. The next week they travel to face Memphis . They’ve taken paychecks to play at Alabama, Houston, Tennessee, West Virginia, Washington and Clemson in previous seasons. Coming off a National Championship Game appearance and Heisman Trophy winning-season by Marcus Mariota in the 2014-2015 season, Oregon hosted Georgia State the next season. “When I went to Oregon [as a freshman in 2015], that was pretty cool just seeing the type of culture that they have,” Hart said. Two seasons ago, the winless Panthers nearly pulled off the biggest win in program history; they held a 17-13 lead deep in the fourth quarter over ninth-ranked Wisconsin at historic Camp Randall Stadium. Georgia State was shutout 56-0 last season by Penn State in Beaver Stadium, one of only eight college football stadiums to hold 100,000 fans or more. However, Hart cherishes the moments of playing at home in Atlanta a bit more. “Penn State was amazing to see 100,000 people, but it’s nothing like playing in front of our home fans. Regardless of what the number is, the people that support us are our families out there. Being out there and being able to play in front of my parents and my brothers and my sisters, nothing beats that,” Hart said. 2018 will be the first season the Sun Belt has a championship game as the conference split its’ 10 teams into east and west divisions. The division champions will play at the home stadium of the division champion with the highest conference winning percentage for the title. The game is slated for Dec. 1 on either ABC, ESPN or ESPN2. “That’s exciting, man. It’s that much more motivating to get there. We got the different sides that we have, so we’ve got to not just focus on winning every single conference game, but focusing on beating the people that are on our side as far as east and west goes,” Hart said. Trips to three of the Sun Belt’s strongest programs in Troy, Arkansas State and Appalachian State give Georgia State one of the conference’s toughest schedules. They are the only teams to win or share the Sun Belt Championship in the past three seasons. The 2018 season opener against Kennesaw State could be the most attended game in Georgia State Stadium history. Kennesaw State’s campuses are less than 30 miles from Georgia State Stadium. The Owls are coming off their best season program history after finishing 12-2 with an FCS Playoffs Quarterfinals appearance.